Change the gridId variable to match the ID of your grid. This code uses the form.setOnchange() method to set an event handler to be executed when the value of a field in the Dynaform changes. The event handler uses .match() to check whether the changed field is found inside the grid. 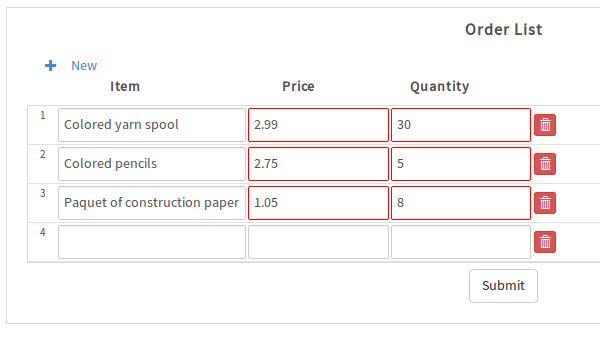 The field ID for a grid field will be something like [orderList][price]. The tricky part is constructing the regular expression used by .match(), because [ and ] have to be escaped as \\[ and \\]. If the field that was changed is inside the grid, then the border color of that field is set to red. This page was last edited on 7 September 2018, at 23:53.